On Saturday the 6th of December I drove ~650km into Hidalgo state and back to Mexico City. 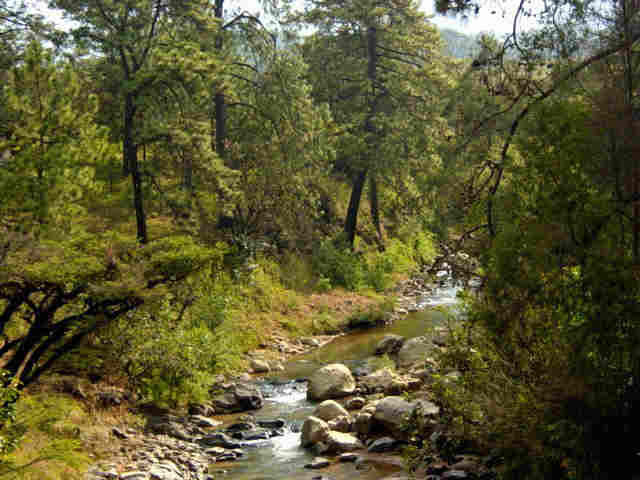 I 1st I explored along the road that passes through El Chico National Park. I stopped at a site where I'd seen P.moranensis and P.acuminata 2 months before, but these were now mostly winter rosettes surrounded by a few sickly summer leaves. I'm not sure P.acuminata was at all visible, I think they'd all retracted into their buried bulbs. I was hoping to find some early flowers of P.acuminata, but no luck. 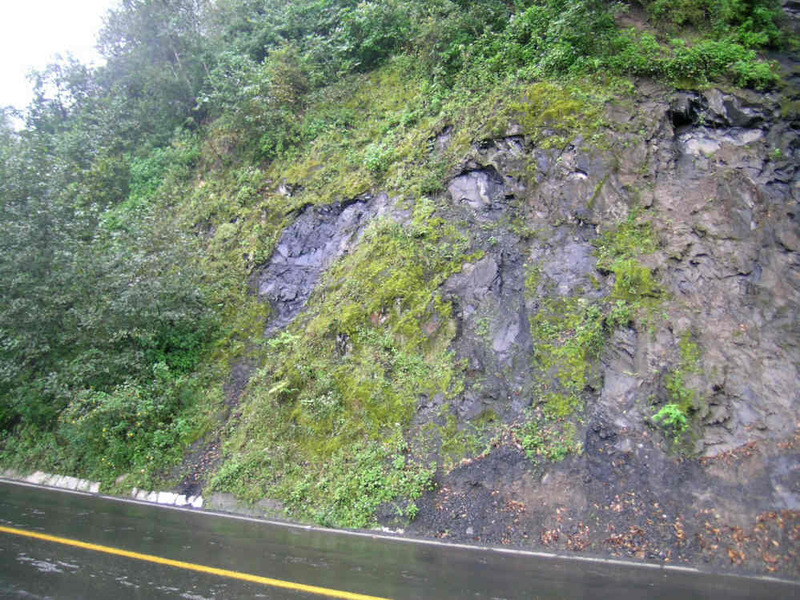 I also explored further along the road and just before the town of Mineral del Chico found a large area by the roadside covered with P.moranensis. I then went to check on P.crassifolia on the cliffs known as Las Ventanas, where I'd seen them in full summer growth 2 months ago. They were now amazingly transformed into small winter rosettes with young flower scapes sometimes resting just above the thick succulent leaves. The walls were no longer dripping with water, although the weather was just as foggy and cool as when I was last there. Sadly, I also caught no early flowers. 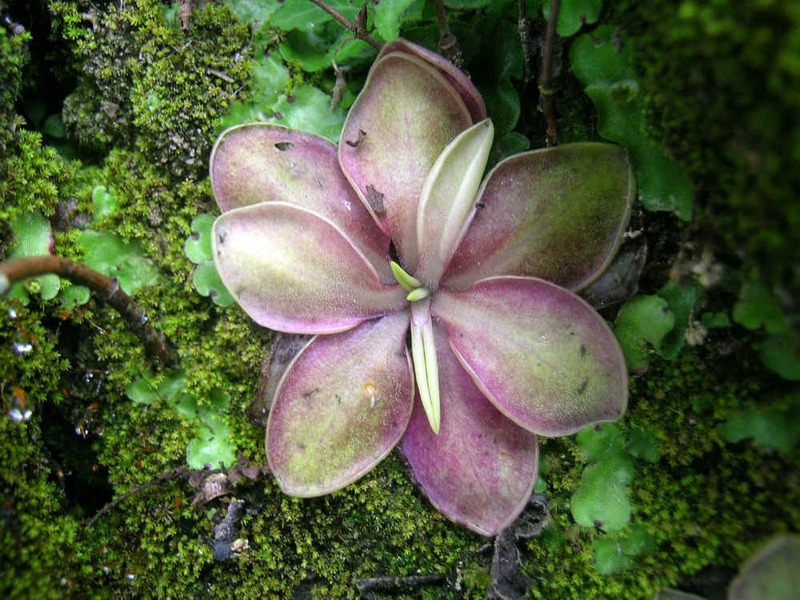 Winter rosettes of Pinguicula crassifolia from Las Ventanas. 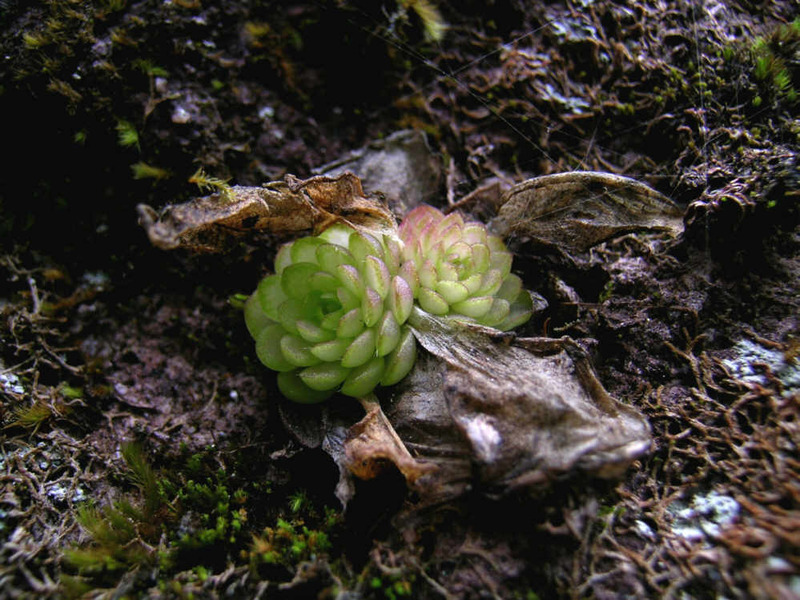 Winter rosettes of Pinguicula crassifolia from Las Ventanas with few remaining dried summer leaves. 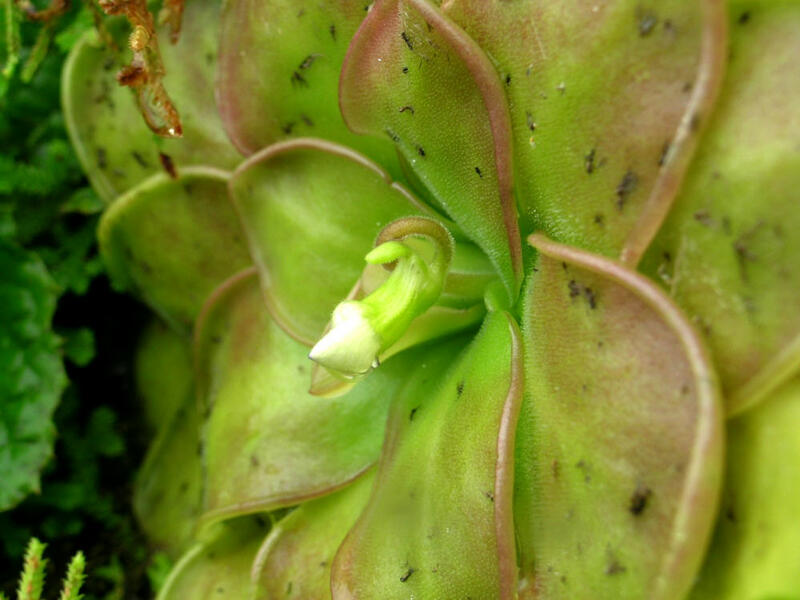 Winter rosettes of Pinguicula crassifolia from Las Ventanas with flower bud emerging. Winter rosettes of Pinguicula crassifolia from Las Ventanas. Note the red coloration of the winter leaves. 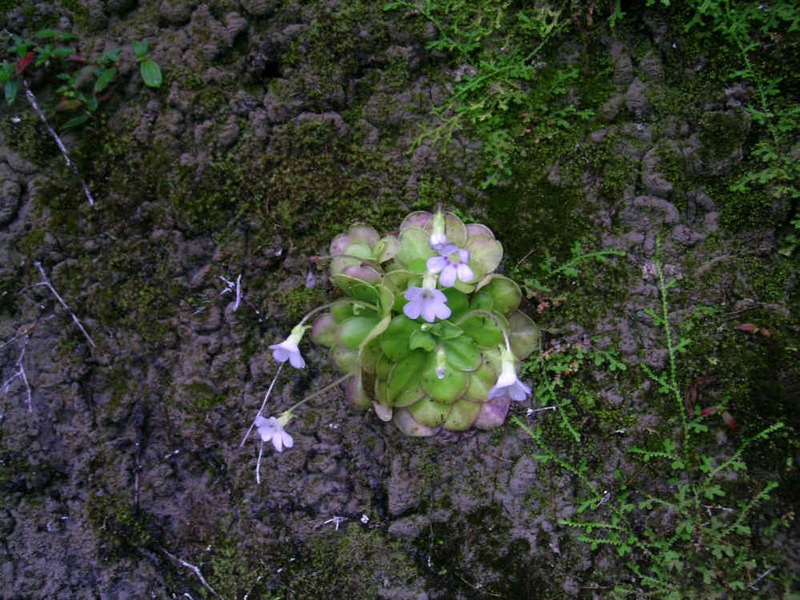 Pinguicula crassifolia is flowering from the winter rosette. Note the size of the plant ! 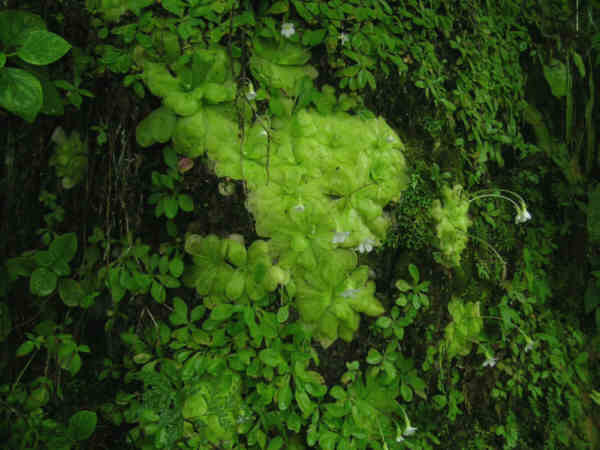 This is apparently the same plant as a P.sp. 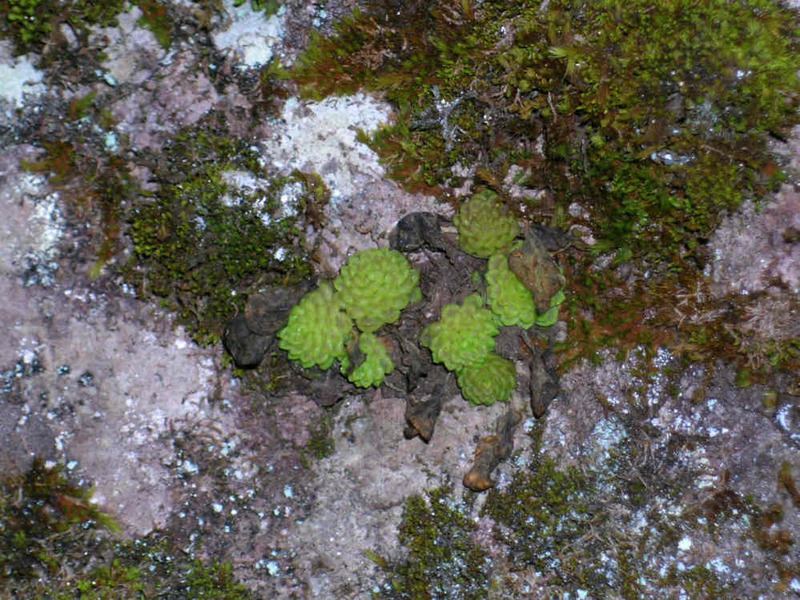 "Molango" or P.moranensis "Molango", which has been going around CP collections, and possibly the same as another form known as P.moranensis "Pachuca". 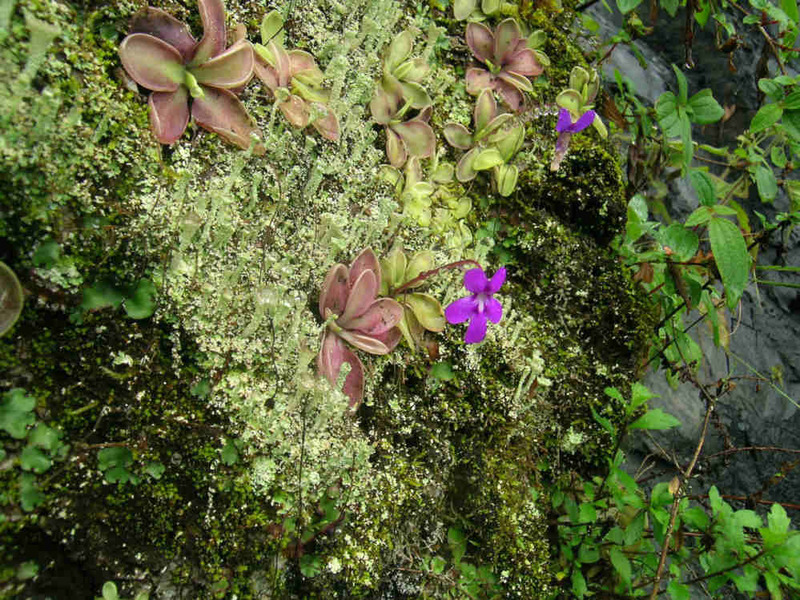 The habitat of the Pinguicula from Molango. The habitat of the Pinguicula from Molango. 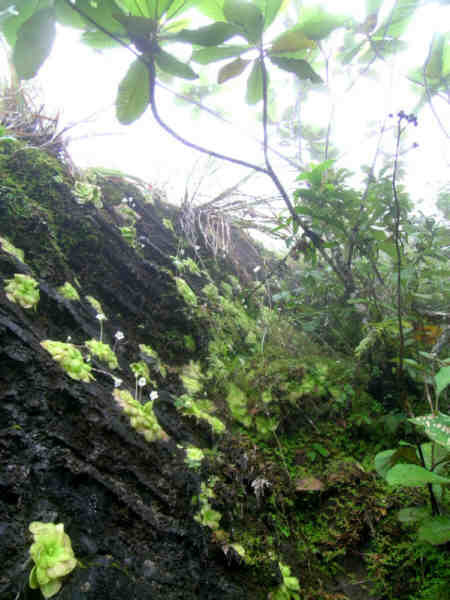 Plants grow on mosses on a black crumbly rock. 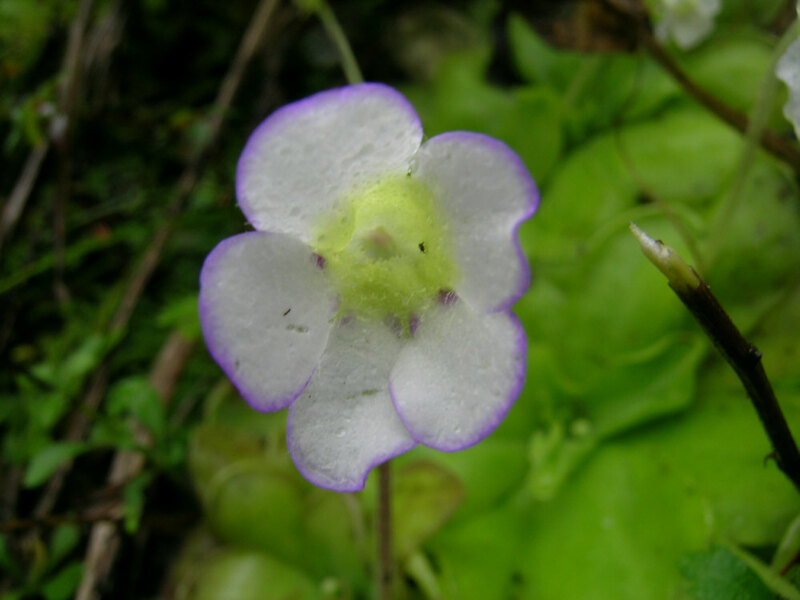 Nice flower of the Pinguicula from Molango. Note the black crumbly rock. 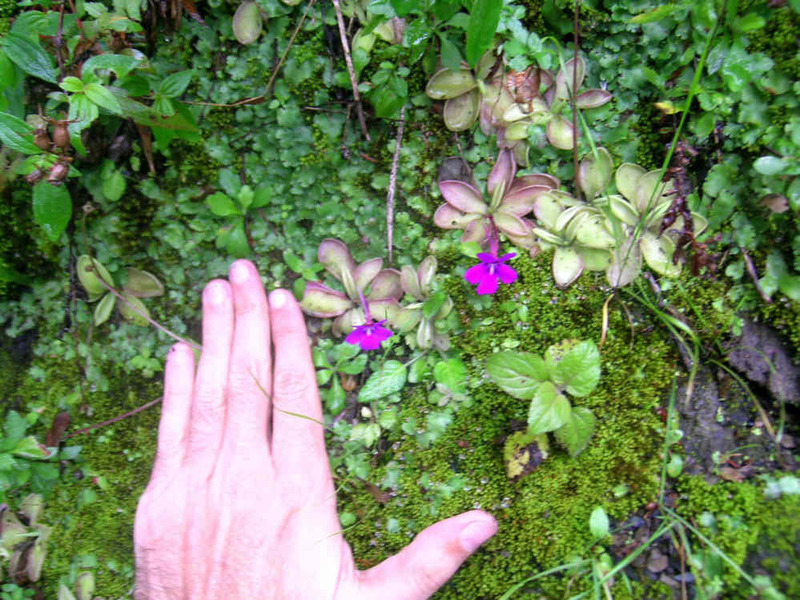 The Pinguicula from Molango are rather small. 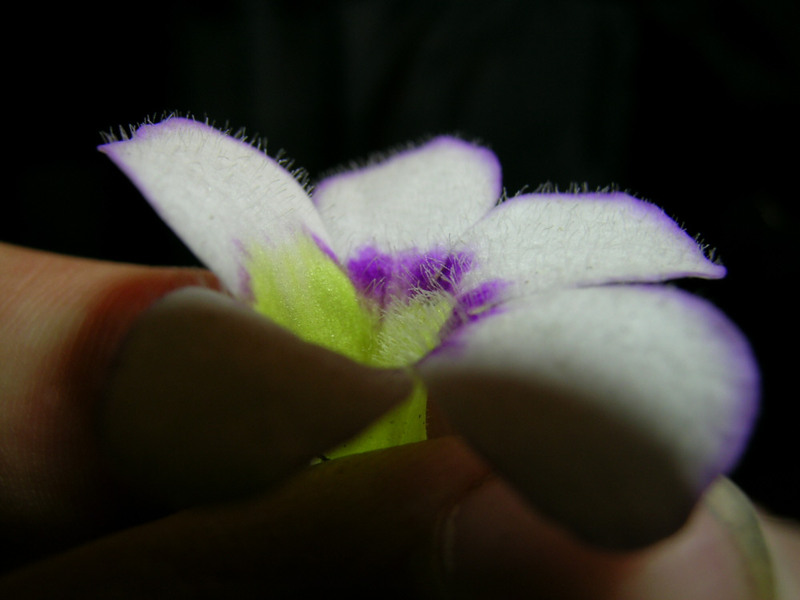 Another flower of the Pinguicula from Molango. 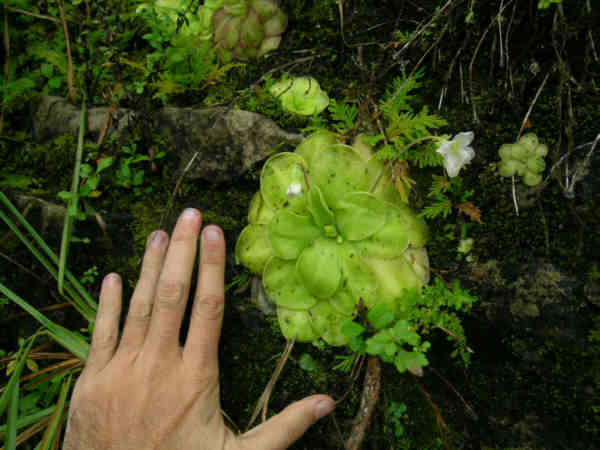 Cluster of the Pinguicula from Molango. 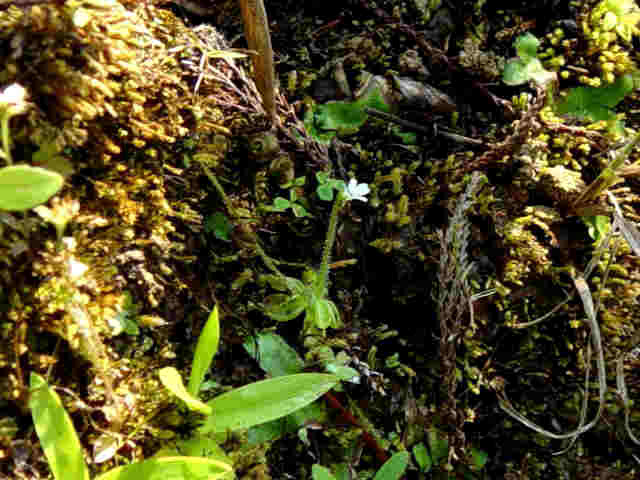 More on this Pinguicula from Molango. 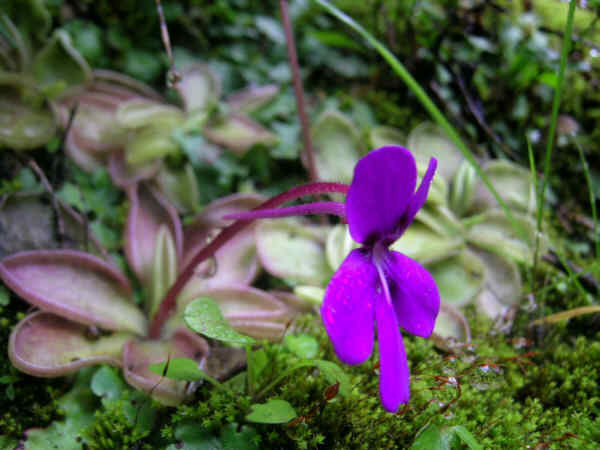 And from a Pinguicula from Sierra de Pachuca. Anyways, the plants were found at ~1400m altitude, in areas of oak and pine forests, they showed no signs of dormancy, there were numerous dark purple flowers everywhere, and they mostly grew on a black crumbly rock. 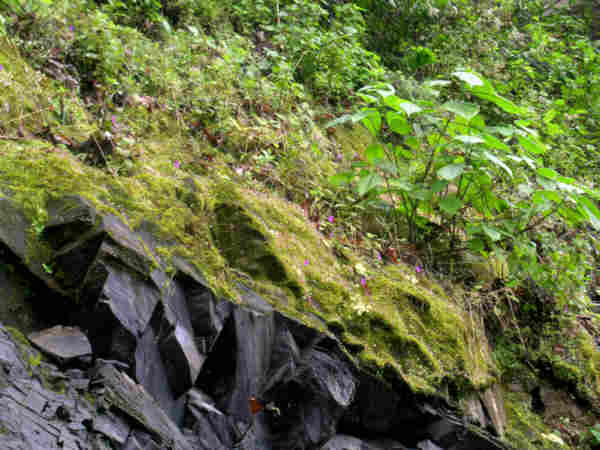 I'm no geologist, but the name "shale" jumps to mind, I have no idea why. The leaf color varied from yellow-green to slightly reddish and sometimes with veins. The leaf color varied from yellow-green to slightly reddish and sometimes with veins. Various specimen of the Pinguicula from Molango collected for studies and herbarium specimen. 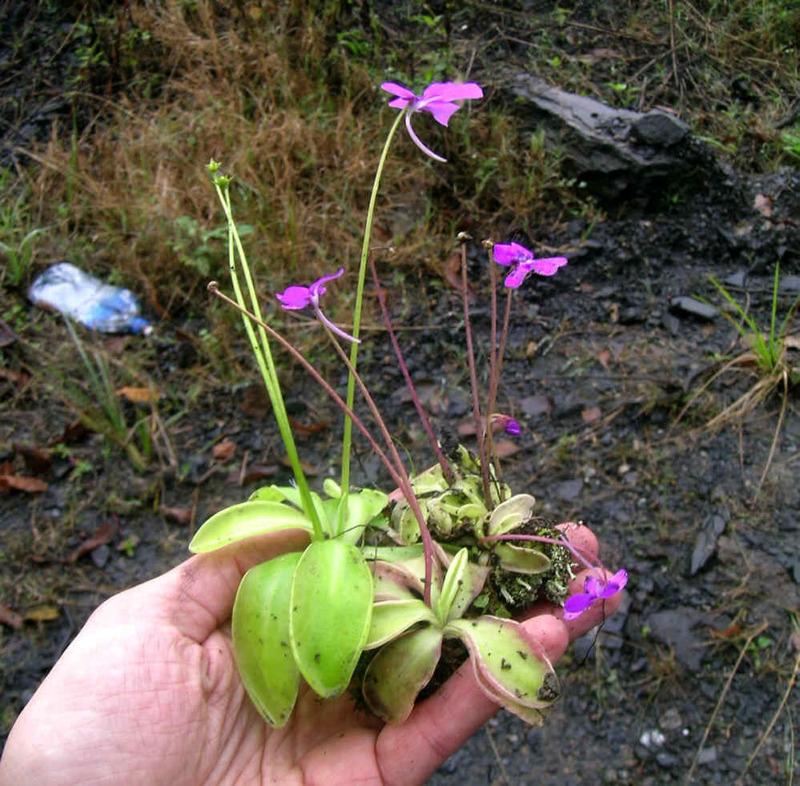 Even further N, just after the town of Tlanchinol, I found another very interesting plant which was in fact my main objective for that day. It was supposedly in the P.agnata complex, I'd seen it in cultivation at Zamudio's place and he told me how he intended to publish it as a new species. It was discovered by our friend Adolfo Ibarra a few years before, I believe. I have to admit it did not impress me in cultivation, and I didn't think much of it. But it sure the hell impressed me in the wild!!! The habitat of a new species supposedly in the P.agnata complex. 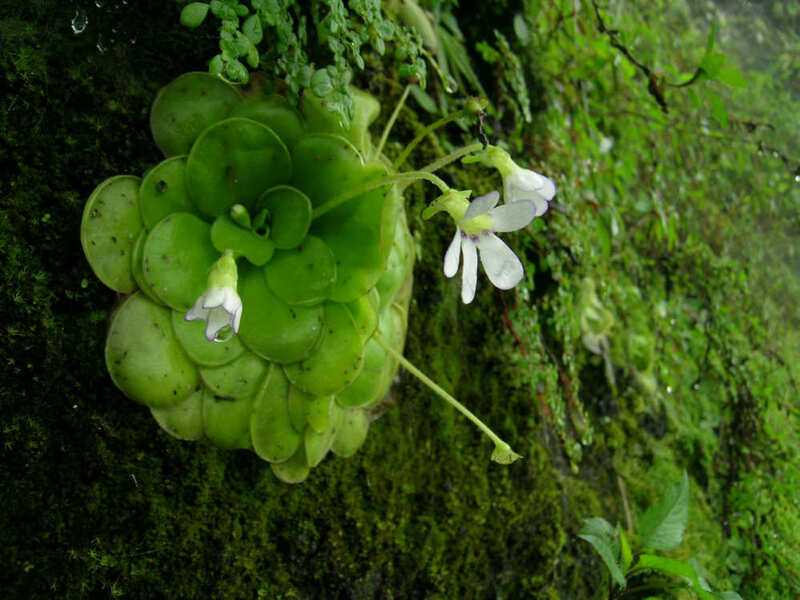 Here are some very interesting plants supposedly in the P.agnata complex. 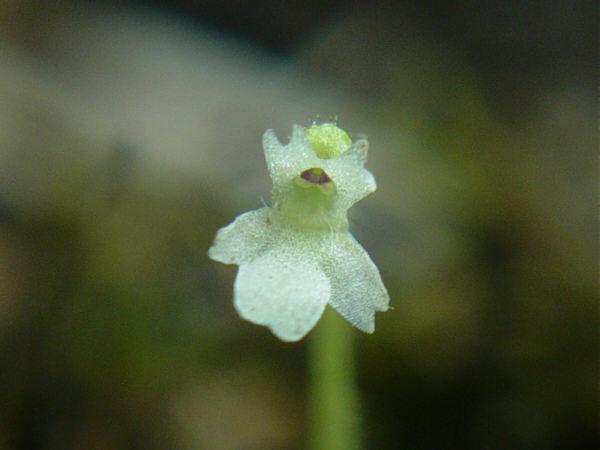 The flowers of this new species have a close similarity with those of Pinguicula agnata. The rosettes are very variable in color. 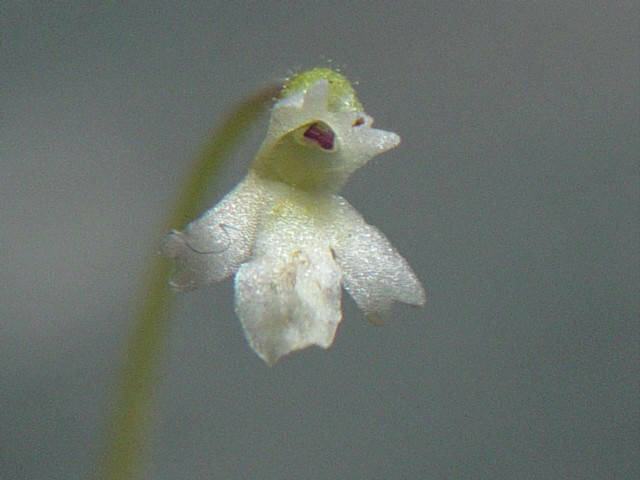 A so close flower to those of Pinguicula agnata. 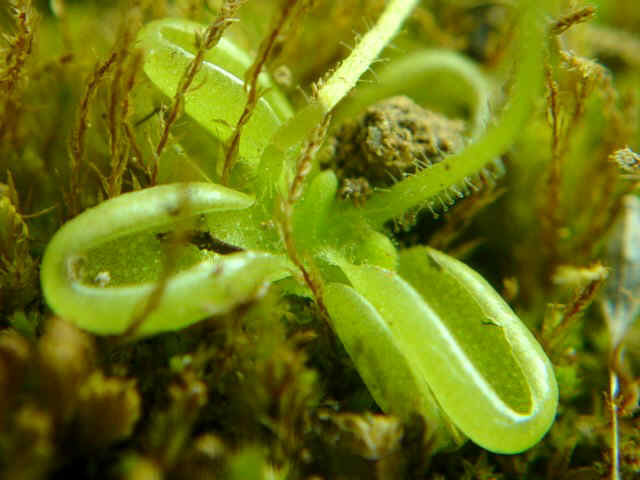 Close up of the rosette of this impressive new species to be described. 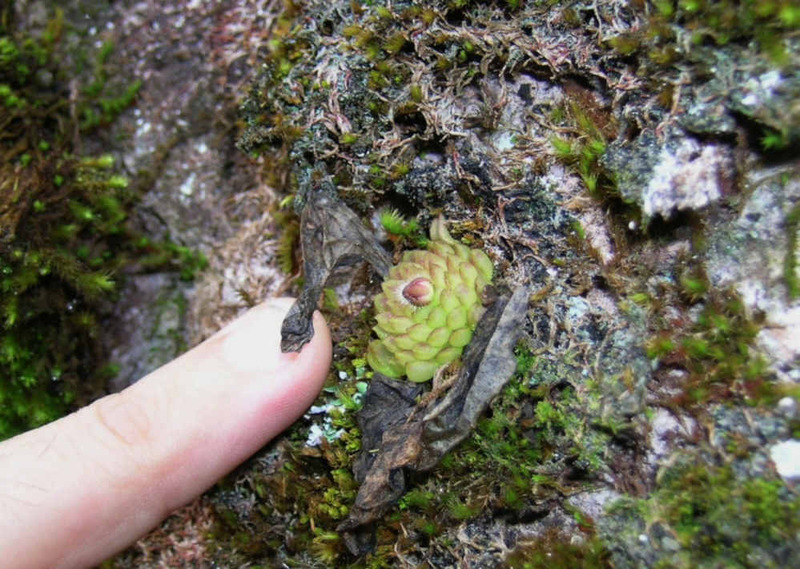 Note the hairy lobes of this new species. 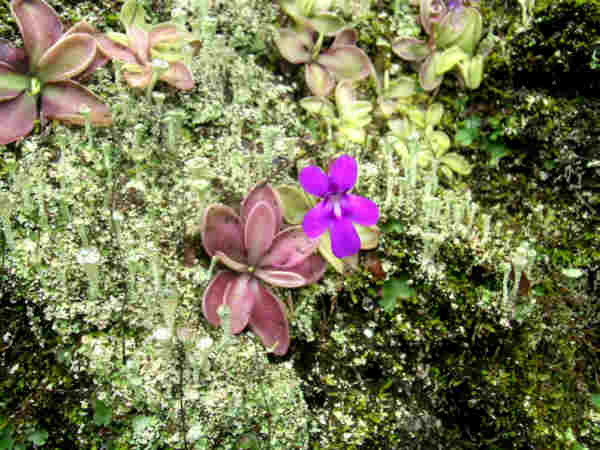 I had my eyes open for P.agnata as I drove down the mountains towards Huejutla. 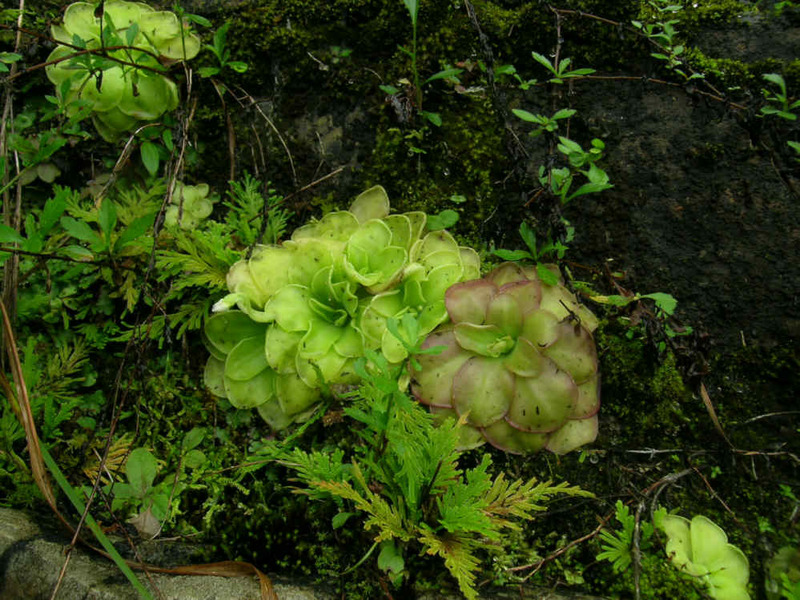 I glimpsed some rosettes on one wall at ~1000m altitude, but dismissed them as "just another P.moranensis population", thinking I'd maybe check them out on my way back. 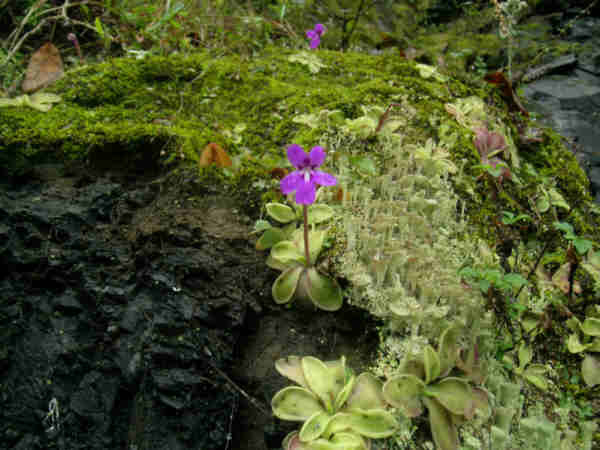 On I drove and not a single sign of other Pinguicula, although because of the heavy fog I drove exceptionally slow, checking every N-facing cliff. I couldn't see a view, but the vegetation along the road suggested I was probably in a rainforest area. I headed back up the road and this time stopped by the "P.moranensis". 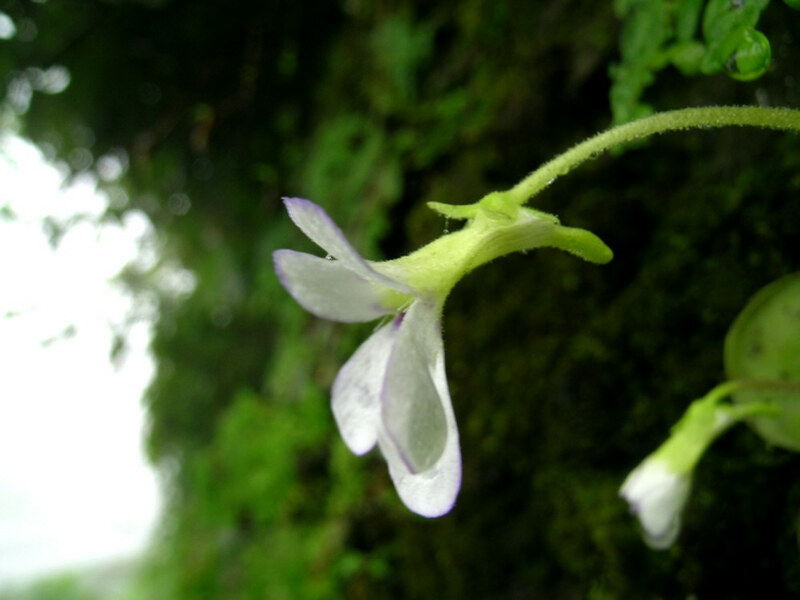 As I got out of the car and walked towards the cliff, I was aghast to see white flowers sticking out from the compact rosettes pressed to the walls. 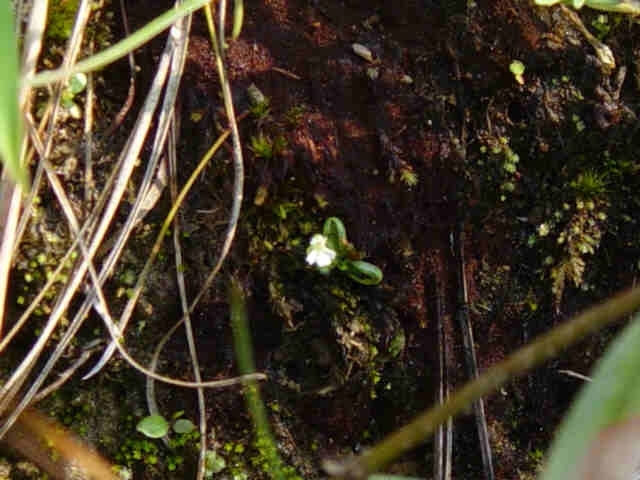 Could it be a white-flowered P.moranensis rumoured to grow in that area? 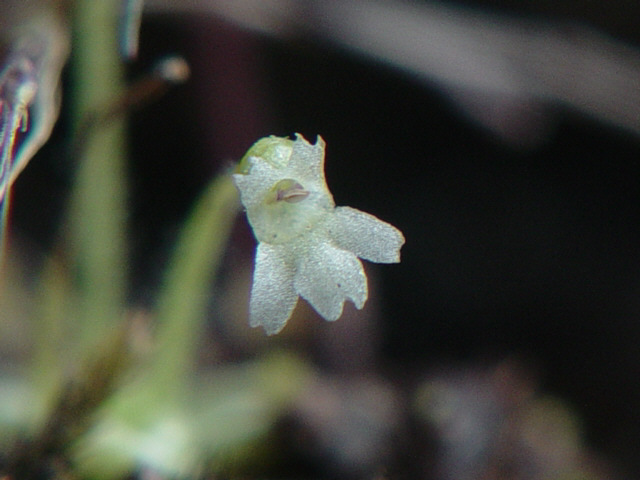 But as I got close I realized those were flowers of the P.agnata type, with short spurs. And man were there a lot of flowers all around! These were quite large and sticking out from very compact rosettes, where the leaves were pressed to the rock, not as thick and succulent as in regular P.agnata, and the leaf edges were rolled inwards. The leaves were sometimes pinkish, but mostly green-yellow. 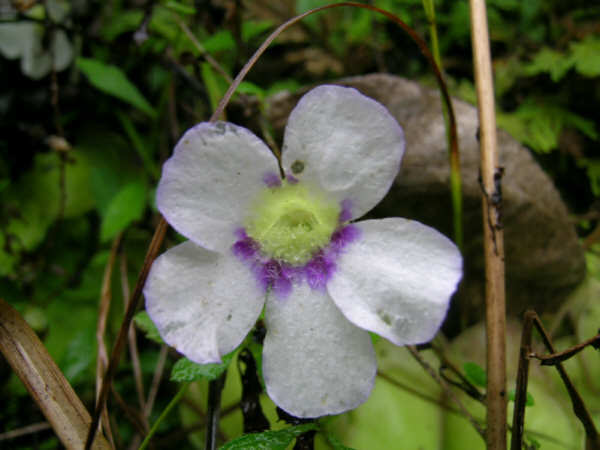 The flowers were white with variable amounts of purple marks on the throat and sometimes with purple rings on the petal tips. This Pinguicula sp. "Tlanchinol" is a great candidate for hybridizations since it probably does not go dormant, has large rosettes, large flowers all year long, and grows at relatively low altitudes meaning it's probably easy to cultivate. On Sunday I went with my good friend Ruben Resendiz to the SW of Mexico state, leaving once more before sunrise. 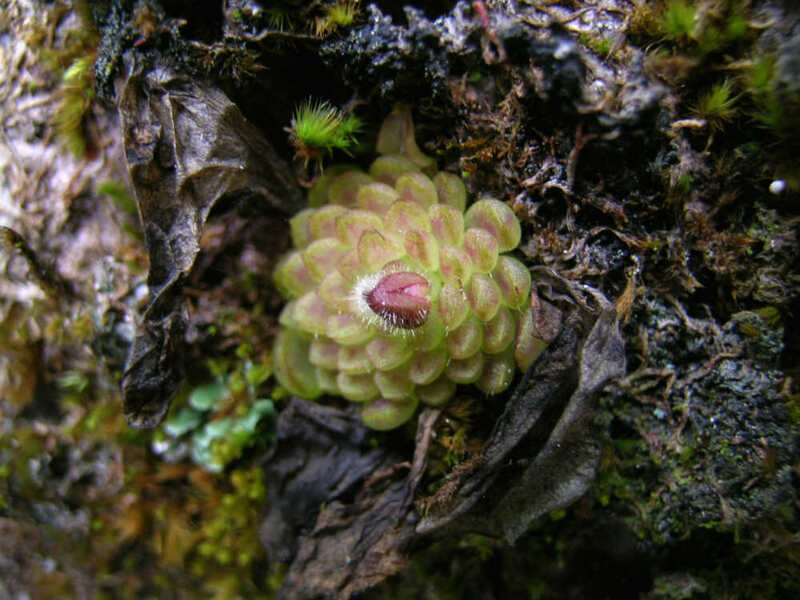 We wanted to check out Nanchititla highlands again, since when we were there 2 months before we hadn't been able to find the mysterious U.hintonii. Nor had we seen P.heterophylla, which was collected there in the 50's. Plus we hoped to maybe catch early flowers of the bulbous species we'd seen, hoping to ID it as either P.parvifolia or P.oblongiloba. Our 1st surprise was that Nanchititla was terribly dry already, with no more water running down the walls and hillsides. The 2nd surprise was that a large stretch of the dirt road had been asphalted. This meant that not only were the P.moranensis and P.parvifolia / P.oblongiloba looking really ugly because of the dryness, receding into thei winter stages, but also that the roadside banks were being stripped of their vegetation by tractors as the asphalt advanced. Fortunately the asphalt had not yet reached the large P.parvifolia / P.oblongiloba sites we'd found previously, and the P.moranensis grew on rocks which had been left alone. Actually, I'm jumping ahead. We found other CPs before going to Nanchititla. But I wanted to leave the best for last... :):) One of the things we were looking for was a population of P.moranensis found in the 70' s where supposedly there were some plants with purple and others with white flowers. I'm almost sure we found the right place along the road in an area of pine forest. The problem is that there were no flowers nor flower scapes anywhere in sight. But our main objective that day was to find P.crenatiloba. This tiny annual was collected in the 80's growing along a river that crosses the road we were on, near the town of Tejupilco. 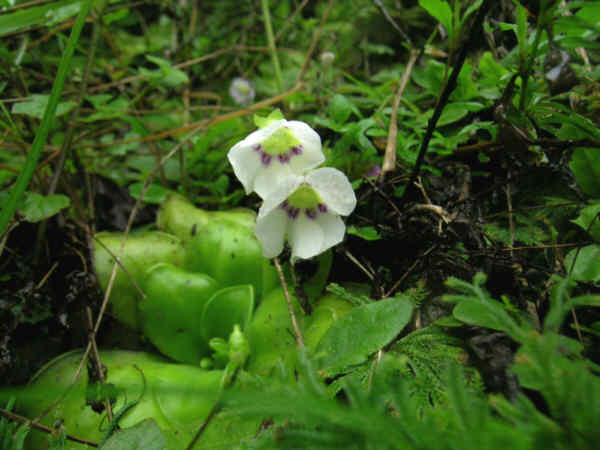 I'd already seen this species in the wild back in September near Taxco in Guerrero state -- but I almost felt as if I hadn't, since I only found 2 plants without flowers. I was dying to see more in order to compare with P.sp. "Tonala", the closely-related new species Ed and I found in Oaxaca. And this would probably be my last chance to see P.crenatiloba, since I'll be going to Brazil on December 19th and will only return to Mexico in early February, when this annual will probably be long dead throughout its range. We found the right river, at ~1600m altitude in a pine forest area, and began exploring its N-facing margin for P.crenatiloba. 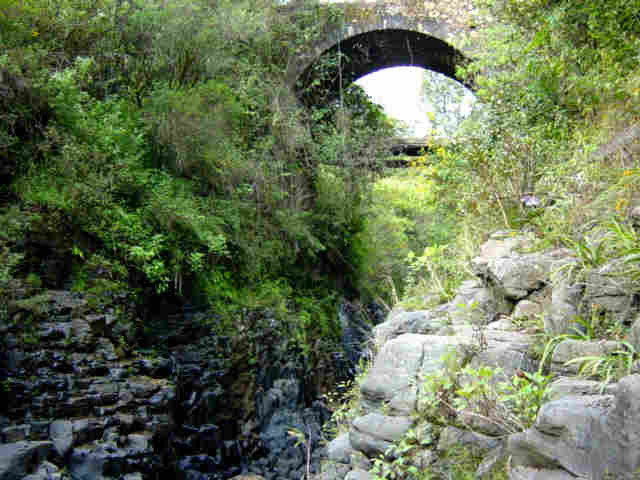 We walked for several hundred meters up and down river, searching all possible habitats, but turned up nothing. Could it be that they'd already died down for the season? Or maybe the habitat had changed too much since it was last collected and they were no longer present. Just as I was giving up, I crossed the river to the S-facing margin, where I began heading back towards the car. The river margin was rather high at one point, almost a vertical wall of reddish dirt. 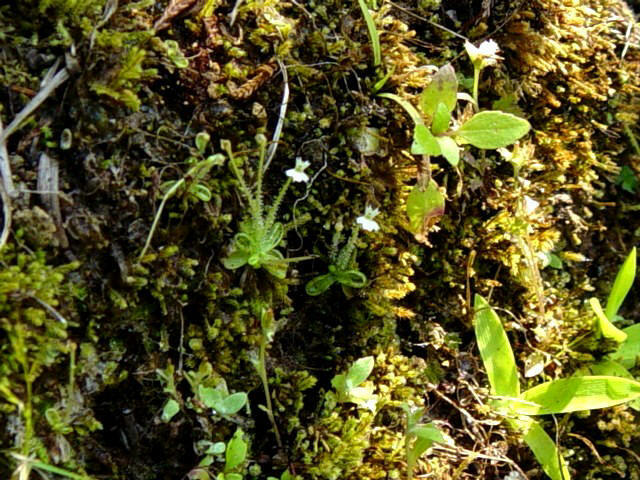 And there among grasses and mosses I found a single P.crenatiloba rosette with 2 flower scapes, one in fruit and one in flower! I screamed as loud as I could, but Ruben could not hear me above the sound of the river and only came by about half an hour later, when he saw that I'd been crouching in the same place for a long time. I must've taken a few dozen pictures of that one P.crenatiloba rosette before moving downriver, afraid I wouldn't find more. But a few steps further on and I did find P.crenatiloba. Lots of them too! The rosettes varied in size, none above 1.5cm in diameter, with none to several flower scapes each. A small area was dotted with many white flowers. 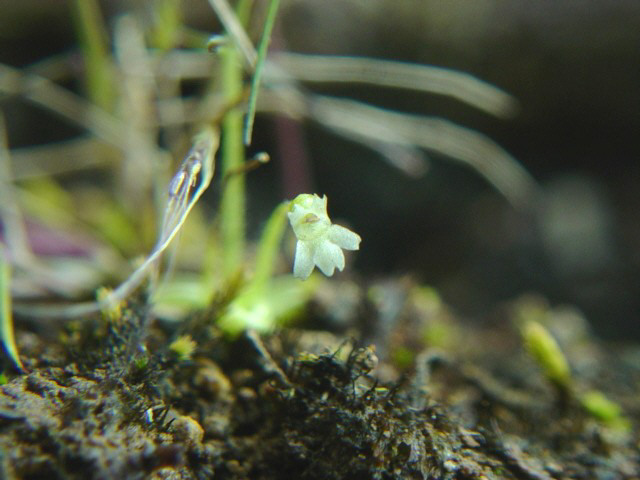 Some plants were amazingly small, some had mostly dead leaves but with still green scapes, and I even saw one that was only a glandular flower scape less than 1cm high with no leaves at all. 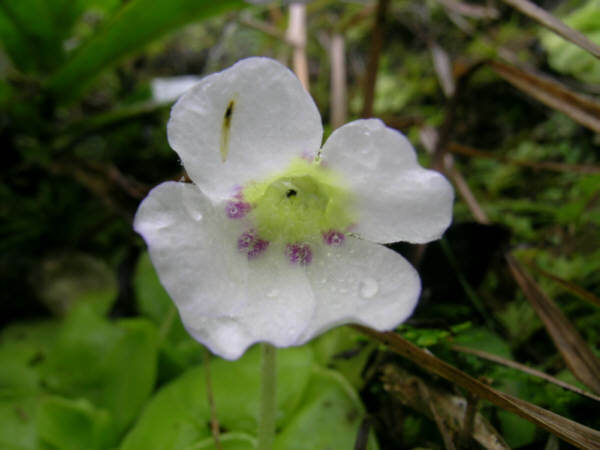 The flowers were white, the larger ones with a clear yellow spot at the base of the lwoer lip. 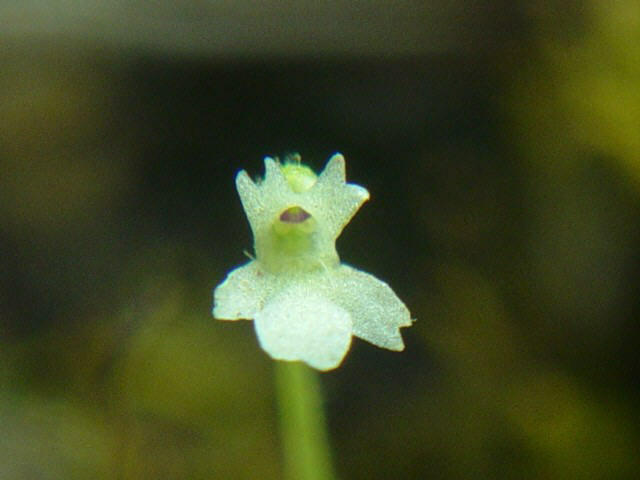 Each petal had a clear notch at the tip, the central lower lip having 2. 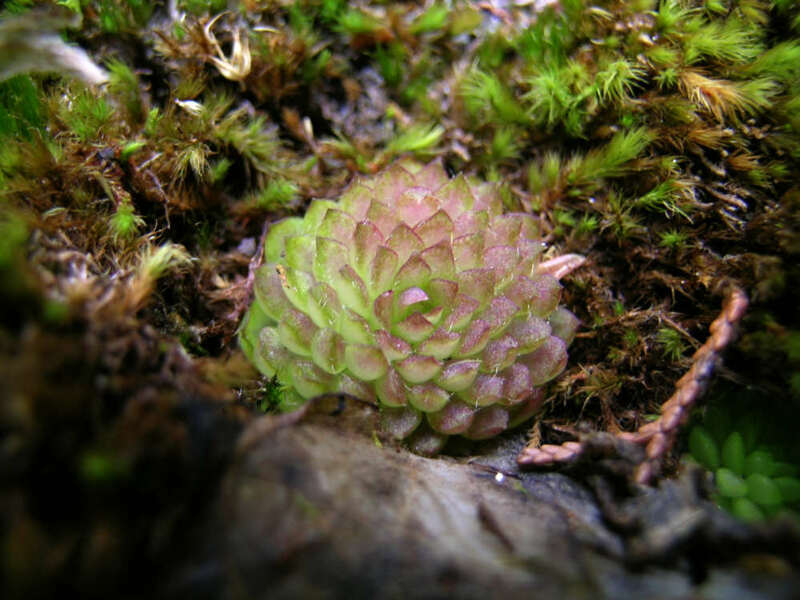 Closeup of the tiny rosette of P.crenatiloba growing among mosses. The tiny flower of P.crenatiloba . Note the crenate lobes. 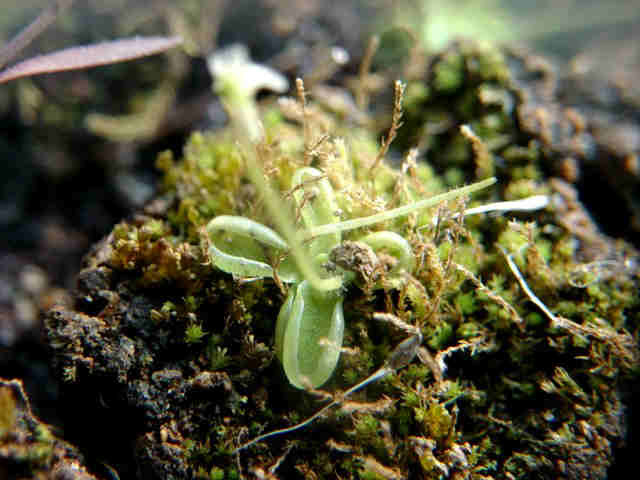 More on this species in the page on Pinguicula crenatiloba.